The cupcakes have been nagging at me. Pressed for time, however, I didn't think I could get another recipe together before the entry. I knew I to leave for several days on a business trip and there were too many things to do before the Feb. 24 cupcake deadline. But at the last minute, I decided to plunge ahead and try something. And it worked! 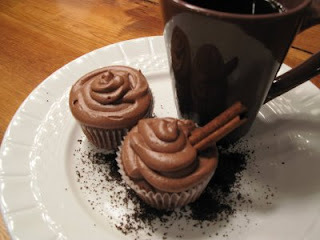 So here we go, my very mundane and plain recipe for Cinna-Mocha Chocolate Fudge Brownie Cupcakes. 1. Take your favorite brownie recipe (even if it is a boxed mix!) and add 1/2 teaspoon of cinnamon and 1 T. of instant coffee to the batter. Mix as directed. 2. Dollop into baking cups, about 3/4 full. Bake at recipe temperature but reduce the time you would normally cook the brownies by at least half or more. Guage by the top -- it should be shiny and with a "brownie crust." You'll want to undercook these so they have a fudgy center. Don't overcook! (this is the secret) In other words, keep your eye on the oven, peeking in your oven window. 3. Remove from oven and let cool. Top with frosting. 4. For Frosting. Brew a pot of cinnamon coffee. Add 1 or 2 broken cinnamon stick to the coffee when brewing. Cream 1/2 cup of butter with 1/2 teaspoon of vanilla, and 4 T. of cocoa powder. Alternately add 1/4 cup of cooled cinnamon coffee to the butter mixture with about a 1/2 cup of powdered sugar. Continue until you have a thick frosting. Put frosting into small baggies (or pastry bag), snip off one end, and pipe the frosting on the cupcakes, nice and thick. Oooooops! I almost forgot to add that when I enter, I am eligible to win the following prizes. Voting opens on March 1, so I'll be sure and let you know where and when! PLUS, IronCupcake:Earth can not forget our good friend, CAKESPY, http://www.etsy.com/shop.php?user_id=5243382, who is now going to be doing a piece for our winner each month until further notice - sweet!As an added bonus for February, SWEET CUPPIN CAKES BAKERY AND CUPCAKERY SUPPLY will be tossing in a variety of cupcaking supplies, http://www.acupcakery.com/index.html.Last and certainly not least, don’t forget our corporate prize providers: HEAD CHEFS by FIESTA PRODUCTS, http://www.fiestaproducts.com/, HELLO CUPCAKE by Karen Tack and Alan Richardson, http://blog.hellocupcakebook.com/, JESSIE STEELE APRONS http://www.jessiesteele.com/; TASTE OF HOME books, http://www.tasteofhome.com/; a t-shirt from UPWITHCUPCAKES.COM http://www.upwithcupcakes.com/. Iron Cupcake:Earth is sponsored in part by 1-800-Flowers, http://www.1800flowers.com/ . These sound wonderful, Maddie! Thanks for posting the recipe. Magdalena, check the recipe again. I realized I left an essential ingredient out of the frosting...the cocoa! So be sure to pencil that in on what you have printed. Good luck! Thanks for the recipe, Maddie! Off topic for a moment, but I wanted to let you know-- you know how Amazon sends reading recs via email. Well, yesterday I received one from them and guess what the recommended read was -- Murder on the Mountain by Maddie James!